He was Hitler's favourite Nazi commando, famously rescuing Mussolini from an Italian hilltop fortress, and was known as "the most dangerous man in Europe". After World War Two, he landed in Argentina and became a bodyguard for Eva Perón, with whom he was rumoured to have had an affair. So when Otto Skorzeny arrived in Ireland in 1959, having bought a rural farmhouse in County Kildare, it caused much intrigue. At 6ft 4in and 18 stone, known as 'scarface' due to a distinctive scar on his left cheek, Skorzeny was an easily recognisable figure as he popped into the local post office. In Irish press reports at the time Skorzeny was portrayed as a glamorous cloak and dagger figure, as Dublin-based journalist Kim Bielenberg recalls. "Skorzeny was depicted as the Third Reich's Scarlet Pimpernel. The tone in newspaper articles was one of admiration rather than repulsion. "He seemed to be admired for his military prowess," he said. But concerns about why this pin-up boy of the Nazi party had come to the country led to questions in the Irish parliament. What was Skorzeny doing there? Did he intend to start Nazi activities in Ireland? Born in Vienna in 1908, Otto Skorzeny joined the Austrian Nazi party in the early 1930s. At the outbreak of WW2 he was initially involved in fighting on the Eastern Front, taking part in the German invasions of Yugoslavia and the Soviet Union. By April 1943, he had been made head of German special forces, in charge of a unit of elite SS commandos. When Hitler's ally Benito Mussolini was overthrown and imprisoned in Italy, Skorzeny was chosen by Hitler to lead the rescue mission. With this success, Skorzeny further enhanced his reputation with Hitler and was promoted to major. He gained international renown when Mussolini was paraded in front of the media with Skorzeny at his side. Winston Churchill even described the mission as "one of great daring". He became the Nazis' go-to man for such operations. Another occurred in 1944 when Skorzeny and his men captured the son of the Hungarian regent, Admiral Horthy. Securing Miklós Horthy Jr after a brief fire fight, Skorzeny's team then rolled him up in a carpet and put him on a plane to Berlin. Skorzeny's last major mission in WW2 was during the Ardennes offensive (more commonly known as the Battle of the Bulge), in December 1944. Skorzeny commanded Operation Greif, where English-speaking Germans dressed in American uniforms used disguised tanks to get behind Allied lines. The plan caused confusion and panic among the Allies. Rumours spread that Skorzeny's men were planning to assassinate General Eisenhower, with the increased security leaving Eisenhower temporarily confined to his Versailles headquarters during Christmas week. Ten days after Hitler took his own life in May 1945, Skorzeny surrendered to the Americans. At Dachau in 1947 he stood trial for war crimes, but the case collapsed and Skorzeny was acquitted. 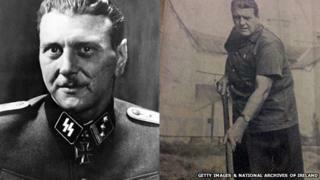 Skorzeny still had to answer charges from other countries and remained held as a prisoner of war. Typically, he escaped - with the help of former SS comrades. He ended up in Madrid and set up an import/export agency. Although much of its business was legitimate, this was said to have been a front for Skorzeny's involvement in organising the escape of wanted Nazis from Europe to South America. Indisputably, Skorzeny made many trips to Argentina, where he met Argentinean President Juan Perón and even became a bodyguard to Perón's wife Eva, reportedly foiling an attempt on her life. Skorzeny travelled from Madrid to Ireland in June 1957, where he had been invited to Portmarnock Country Club hotel in County Dublin. Kim Bielenberg reflects on the welcome Skorzeny received at the reception held in his honour. "He was feted by the Dublin social glitterati, including a young politician, Charles Haughey, who was later to become Ireland's most controversial prime minister." "According to the Evening Press account, 'the ballroom was packed with representatives of various societies, professional men and, of course, several TDs [parliamentary representatives]'," the journalist said. Bielenberg believes this warm welcome may have encouraged him to buy Martinstown House, a 160 acre farm and mansion in the Curragh, County Kildare, in 1959 and assesses the impression Skorzeny created with the locals. "He could be seen driving across the Curragh in a white Mercedes and would visit the local post office for groceries. "Reggie Darling, a local historian, told me he remembered coming across Skorzeny on the Curragh. "He recalled him as a big man who stood out because of the scar across his face (which was the result of a duelling contest as a student), but that he wasn't particularly friendly and he didn't really mix with local people," he said. Rumours and conjecture surrounded Skorzeny's regular visits to Ireland over the coming years. Documents at the Irish National Archives in Dublin reveal that he was granted temporary visas to stay in Ireland, on the undertaking that he would not enter Britain. State records from 1958 mention his indignation at the continual refusal of the British authorities to allow him entry. Newspaper reports in the 1960s alleged that Skorzeny had opened up an escape route for ex-Nazis in Spain and that his farm in Ireland was a place where fleeing Nazis could hide, but no evidence was found to substantiate this claim. In the post-war period, Europe was still haunted by the spectre of Nazism and there were concerns that it would return as a political force. With that in mind, the former Irish minister for health Noel Browne was very concerned about Skorzeny's presence in Ireland and raised the matter in the Irish parliament (Dáil), in 1959. The minister expressed concern that Skorzeny was engaging in "anti-Semitic activities". On another occasion Browne told the Dáil: "It is generally understood that this man plays some part (in neo-Nazi activities) and, if so, he should not be allowed to use Ireland for that purpose." There were a number of memos and letters involving Irish government departments, such as the Department of Justice and the Department of External Affairs, addressing concerns about Skorzeny's presence in Ireland. When interviewed, Skorzeny denied that he was involved in Nazi activities or politics. He said that he would like to buy horses and that one day he wished to retire to Ireland. But that did not happen and he was never granted a permanent Irish visa. He lived out his remaining years in Madrid, where he died of cancer in 1975. Skorzeny never denounced Nazism and was buried by his former comrades with his coffin draped in the Nazi colours. In addition to Skorzeny, a number of high-profile Nazis, including Albert Folens and Helmut Clissman, came to Ireland in the aftermath of WW2. In Hidden History: Ireland's Nazis, a 2007 documentary by Irish state broadcaster RTÉ, presenter Cathal O'Shannon estimated that between 100 and 200 Nazis moved to Ireland. O'Shannon, who was an Irish-born Royal Air Force (RAF) veteran, described how he felt that anti-British sentiment in Ireland led to Nazis receiving a warmer welcome than he did when he came home after the war. Kim Bielenberg believes it is important to consider the context of the time. "They must have felt reasonably welcome, and were probably left alone, or even feted, as Skorzeny was. I am not sure that the full horror of Nazi atrocities had sunk in in Ireland," he said. "There also may have been an attitude among certain nationalists that 'my enemy's enemy is my friend'. Irish attitudes to Nazis changed from the 1970s on, as issues such as the Holocaust entered public consciousness." For Bielenberg there is also a personal link to Skorzeny, as he explains. "Skorzeny was involved in rounding up and torturing members of the German resistance after their attempt on Hitler's life. One of these plotters was my own grandfather, Fritz von der Schulenburg", he said. "After he was arrested with other resistance leaders, Skorzeny arrived and pulled off their military badges. The plotters were then forced to listen to a speech given by Hitler on the radio, confirming that the fuhrer was indeed still alive and well. "My grandfather was executed in Berlin in August 1944." "My mother came to live in Ireland and married the son of Peter and Christabel Bielenberg, associates of senior resistance figures. She lived in the same county as Skorzeny. "I only discovered the house's past and the Skorzeny link when I went to dinner there with my German family just after her death."